Welcome to the future of onDemand fitness. Live class participation increases by 12% when clubs add virtual classes! D I D Y O U K N O W ? Health Clubs, Military Bases, Fitness Studios, Schools, Universities, Planned Communities, Hotels, and More! Sweat Pro, powered by Studio SWEAT onDemand, is the ultimate virtual fitness program for your clients, residents, guests, and customers. We offer the best onDemand workouts for gyms and other commercial businesses. Our top-notch virtual workouts can be used for group classes or individual workouts. We don’t use actors or fitness models. Our onDemand classes are led by motivating, world-class trainers and feature real people--and all for a great price. With Sweat Pro, you’ll increase your customers’ satisfaction, boost your revenue and reputation, and save money. Virtual workouts. Real results. This is Sweat Pro. Get in touch with us and find out how we can help you build a stronger organization. We offer a variety of affordable plans and options to meet your unique business needs. Give your people the gift of fitness! Creating a virtual gym in your commercial facility will encourage long-term usage from your clients. With our virtual fitness program for health clubs and other facilities, you won’t need to pay for expensive trainers or special equipment. And with the ability to stream on multiple screens, you can maximize the number of participants that can join in the fun. Add value and build your customer base with our huge variety of fat-torching workouts, fitness challenges, and group classes, taught by the best in the business. Yoga, Spin®, TRX®, HIIT/Tabata, Core, Body Sculpt, Kickboxing, Zumba®, Barre, Pilates and more, with new classes added all the time. With hot new releases every week we’ll constantly deliver a huge library of hundreds of online workouts with your very own virtual personal trainers. Stream classes on any screen, like TVs, projectors or tablets! Need a backup? We’ll provide you with some downloadable classes, just in case. Our onDemand workouts are unscripted andfeature everyday people led by real, world-class trainers. Participants feel like they’re right there with us in the studio, giving them the drive and motivation to come back and crush their goals. We offer the convenience of a wide variety of fat-torching workouts. Our classes vary in duration, intensity and skill level—so, no matter who’s working out, they’ll always find the perfect class just for them. Get the scoop on your virtual gym’s usage, including which classes are more popular and how your program is being used. 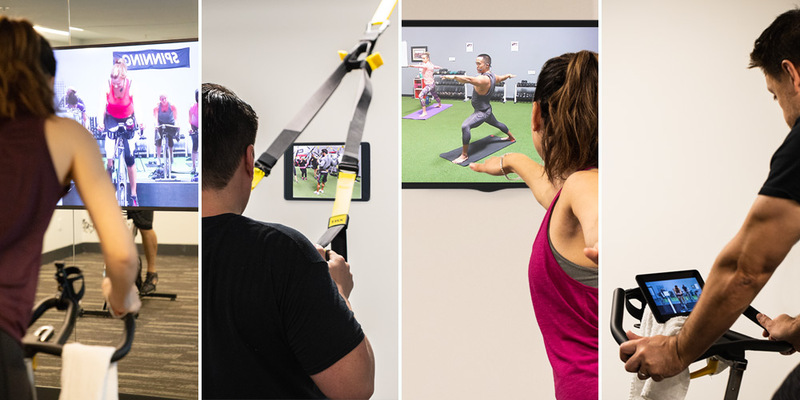 No need to buy expensive equipment from us to offer fitness onDemand to your clients— because if you can set up Netflix, you can set up SWEAT Pro. It can be used with these devices: Roku, Apple TV, Android/Google Mobile Apps, Amazon Fire, iPad, smart TVs and many more. Basically, if you have internet access, you can use your device to stream our killer workouts right into your facility. Choose from multiple streaming solutions and get your brand-new program running within 24 hours. And if you ever need customer service, we’re just a call or click away. We’ll provide you with images and flyers that you can print or post online, a wall banner and a window decal, so you can announce your virtual fitness program to the world and keep engagement up. We’ll also give you a menu of classes and digital logos created especially for social media. The hottest onDemand workouts. The best in virtual fitness.